Until the mid-1970s, the February 22 birthday of George Washington, hero of the Revolutionary War and first president of the United States, was a national holiday. during the Civil War (1861-1865), was a holiday in most states. In the 1970s, Congress declared that in order to honor all past presidents of the United States, a single holiday, to be called Presidents' Day, would be observed on the third Monday in February. 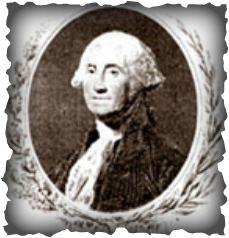 In many states, however, the holiday continues to be known as George Washington's birthday. who has met with — or ministered to — every U.S. President since Harry Truman in 1950. 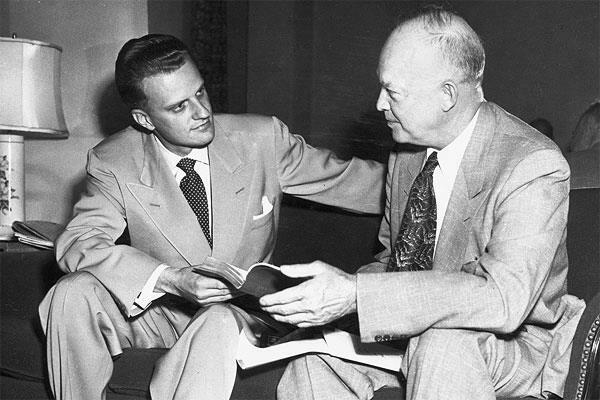 Billy Graham met with President Truman in 1967 at Truman's Missouri home. "Eisenhower was the first President that really asked my counsel," said Mr. Graham. 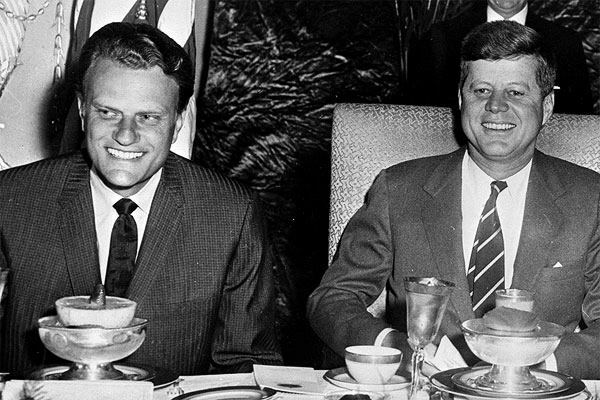 we would like to take a closer look at Billy Graham’s role in the lives of the men who held this office. 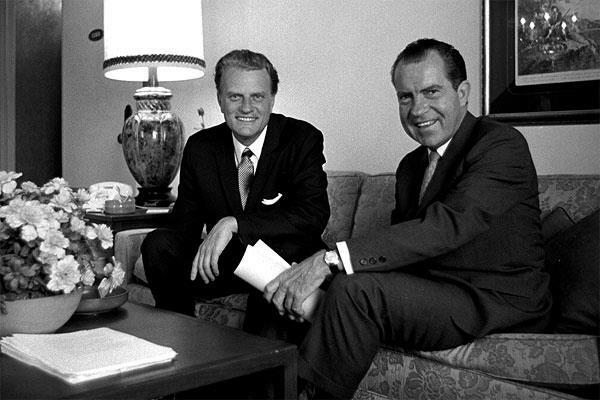 Billy Graham in the White House, offers details about these fascinating relationships. Meeting John F. Kennedy in the White House. 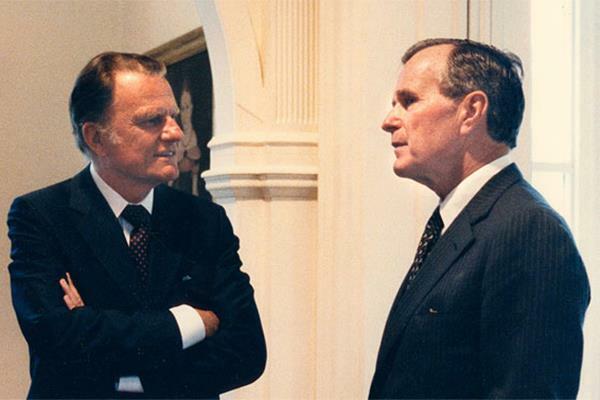 They knew Billy Graham was someone they could trust. His friendship was a safe place for them. With John F. Kennedy at the National Prayer Breakfast. is currently the Washington Bureau Chief and Assistant Editor. national politics, Congress and national security. 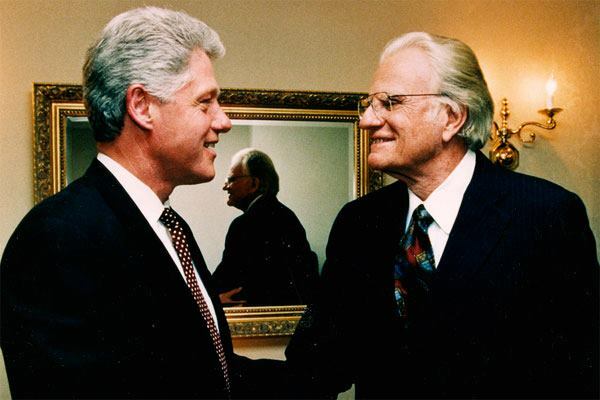 few have fascinated him like Billy Graham’s relationships with U.S. presidents. 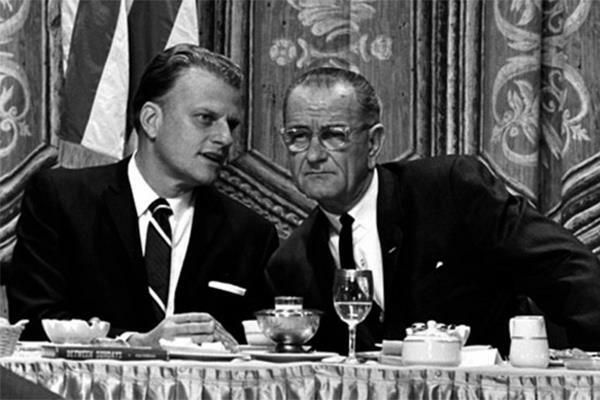 Billy Graham and Lyndon Johnson at the National Prayer Breakfast. 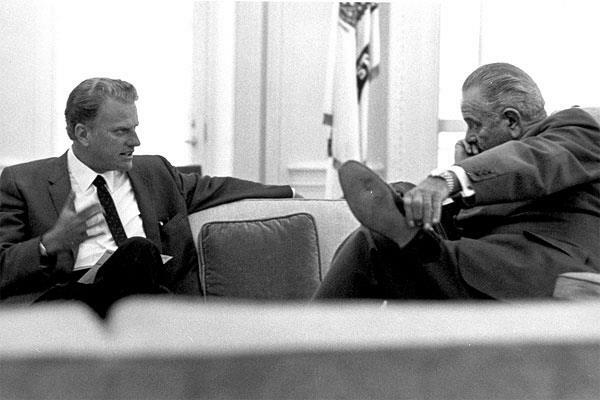 The Preacher and the Presidents: Billy Graham in the White House. The book chronicles details of Graham’s relationship from Harry Truman through George W. Bush. 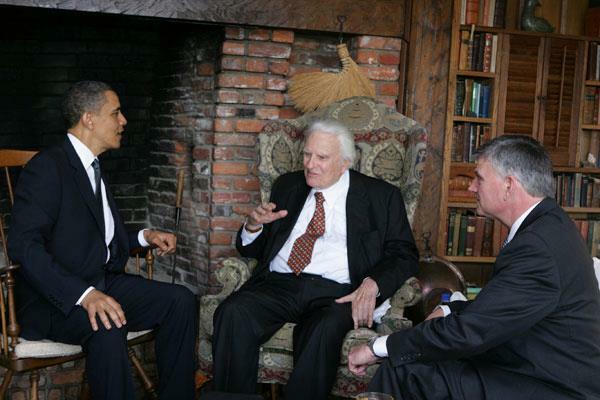 President Barack Obama has also visited Billy Graham at his North Carolina home. He worked hard at his friendships with them,” explains Duffy. Mr. Graham and President Richard Nixon had a long friendship. 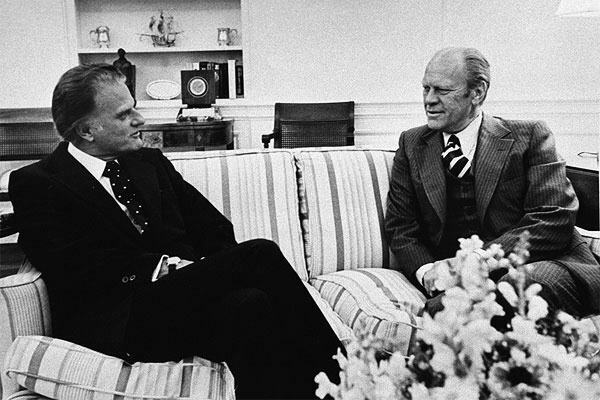 Mr. Graham visited President Gerald Ford at the White House in the mid-1970s. 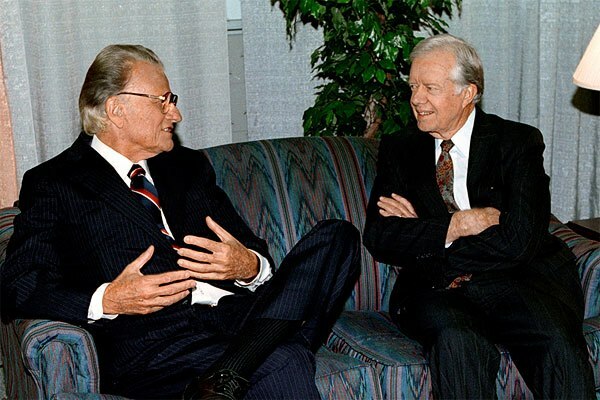 Former President Jimmy Carter met with Mr. Graham privately during the 1994 Atlanta Crusade. Jimmy Carter contributed—through service—to BGEA prior to his years in the Oval Office. 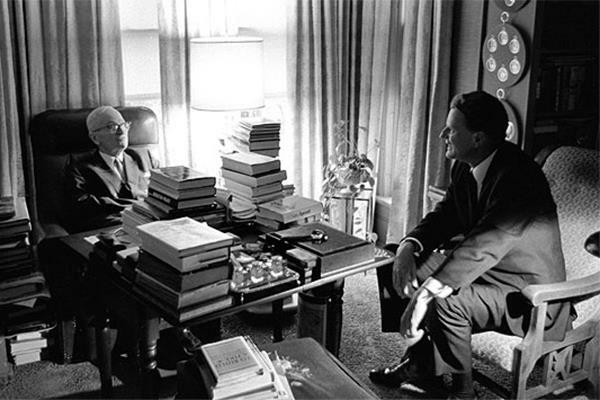 Carter began reading Graham’s books and listening to his sermons long before he was elected. 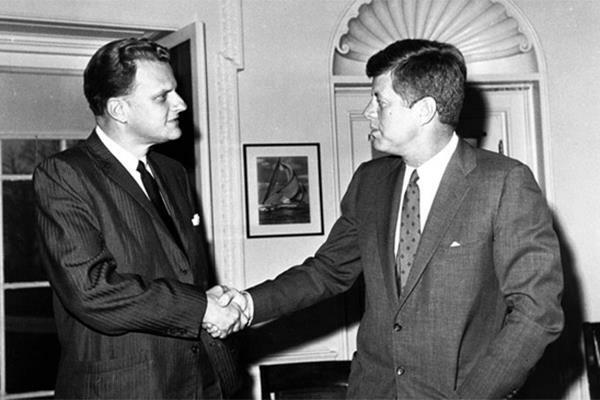 In 1962, he was even involved in the organization of a Crusade in Southwest Georgia. 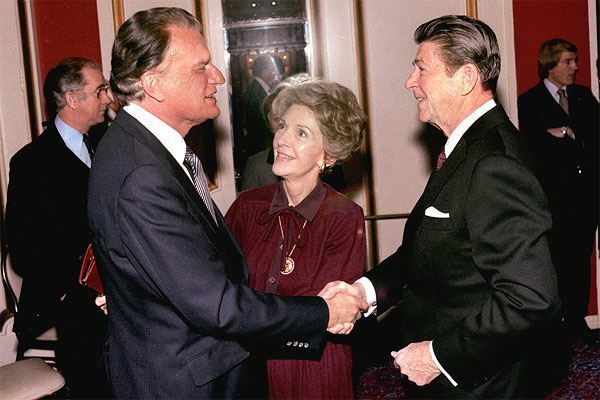 Billy Graham knew President Ronald Reagan since the year he married Nancy. One example of these pre-presidential friendships is the one he shared with Ronald Reagan. Graham first met Reagan in the early 1950s, around the time that he and his wife Nancy married. Their paths crossed again in the mid 1960s when Reagan served as the Governor of California. This time, the interaction was of a more serious spiritual nature. It is during that time that Ronald Reagan is believed to have tremendously grown in his faith. 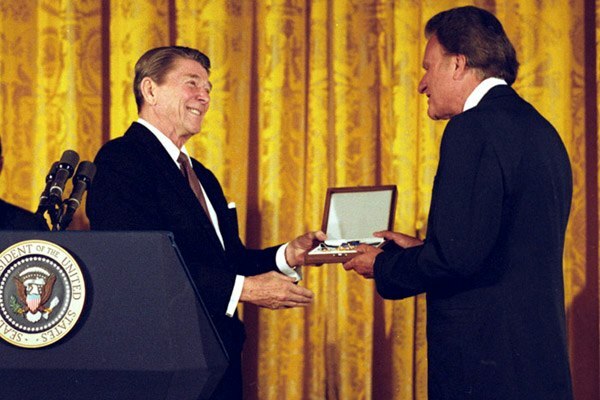 President Reagan presents Billy Graham with the Presidential Medal of Freedom. “He knew these presidents needed support, regardless of politics. Mr. Graham visited President George H. W. Bush in 1991 at the White House. “These meetings were far more than photo opportunities. the ones that mattered are the ones that we didn’t know about,” said Duffy. “They knew Billy Graham was someone they could trust. His friendship was a safe place for them—almost sacred. 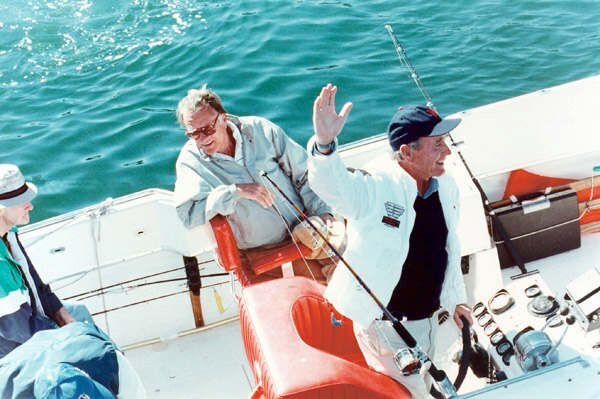 Billy Graham and President Bush enjoy fishing off the coast of Maine. is Graham’s friendship with the presidents, regardless of their political positions. President William J. Clinton was 12 when he first heard Mr. Graham preach in his home town in Arkansas. to attend a Billy Graham Crusade in the late 1950s. that the crowds be de-segregated. to a Crusade in Oakland, Calif., for a date. He wanted her to hear the preacher he so loved as a boy. Mr. Graham with President George W. Bush. 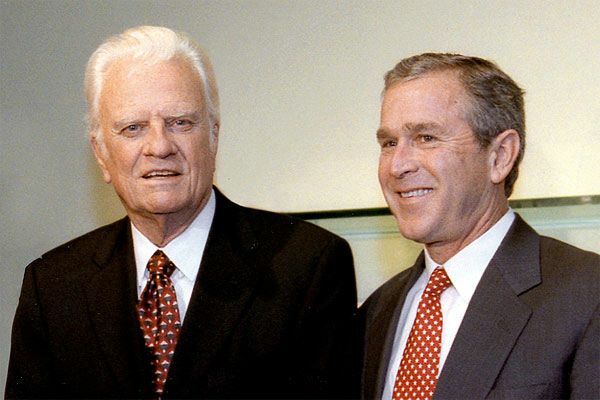 between Billy Graham and the presidents is the one with George W. Bush. Graham visited with the family at their vacation home in Kennebunkport, Maine. and spent some one-on-one time with the younger Bush. This is said to have been one of the most pivotal times in the spiritual life of George W. Bush. as he sensed the pressures of the office and had compassion for these men. 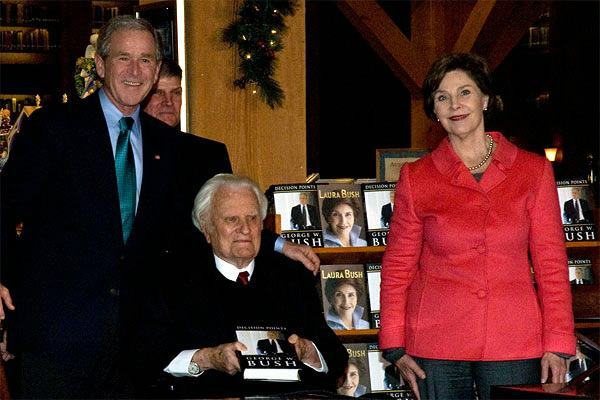 as they signed books at the Billy Graham Library in December 2010.
sown into the hearts of our presidents by Billy Graham. President Barack Obama visited Mr. Graham (and son Franklin) at home on April 25, 2010. "I am pleased to have had President Obama in my home this afternoon," said Mr. Graham. "He requested a meeting since he was spending the weekend nearby in Asheville. My son Franklin and I enjoyed a brief visit with the President, followed by a time of prayer together. authority, and especially for the men and women serving in our military." 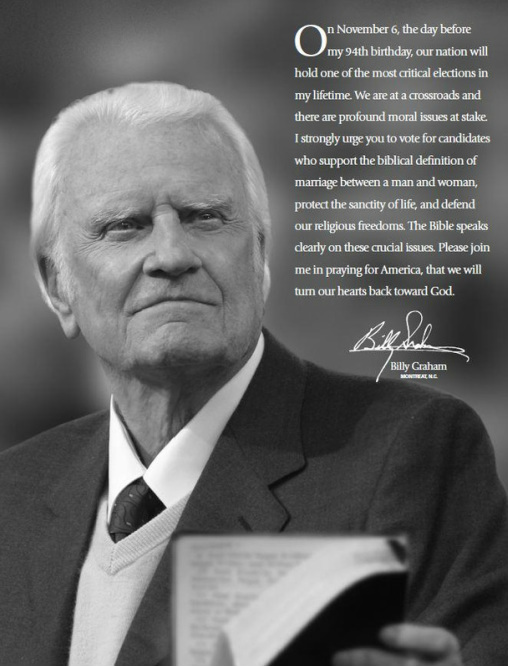 November 8, 2012 was Billy Graham's 94th birthday. I love you for being a man who believes that all men are created equal, just as God says. and that you tried to help Martin Luther and President Kennedy. I love you much. God has used you greatly, Billy Graham, and I know it is because you made yourself available to Him. I hope He continues to bless you in this life, and that we will get to meet in heaven someday. He loved the Lord and poured his heart out for all mankind, just as Jesus died for all mankind.